On Saturday May 13, 2017 after 10:29 a.m., Cook County Sheriff’s police managed a crash scene that was classified as a crime scene when it was learned that a suspect, possibly armed, was involved in a life-threatening crash at Lake Cook Road west of Nichols Road while fleeing Buffalo Grove Police Department. The suspect was pronounced dead later Saturday afternoon. Cook County Sheriff Sgt. Burke, who was managing the scene, at least in the early 90-minutes of the investigation, failed to secure the perimeter, and failed to minimize contamination of the inner perimeter up to one hour or more after the crash occurred about 10:27 a.m. Saturday. The crash and crime scene investigation closed Lake Cook Road in both directions for several hours into the afternoon. When a crime scene is established by police, it usually has some telltale signs. However, a crash scene observed over several hours Saturday May 13, 2017 did not look like a professionally managed crime scene. Congregation of police, fire/medic personnel and a non-law enforcmement photographer inside the inner perimeter of a crime scene at a fatal crash. When a crime scene is declared, admission to the inner perimeter usually becomes restricted in the professionally managed crime scene. A credentialed, but not official law enforcement photographer, was allowed to walk freely inside the “crime scene” perimeter. A group of firefighter/paramedics were allowed to congregate near the inner perimeter after they completed extrication and treatment of patients. In fact, a large group was congregated casually near the scene of the crashed vehicles about one hour after the call for the crash was dispatched. Once firefighter/paramedics were done rendering aid and removing patients at the crime scene, they should have been directed out of the inner perimeter of the crime scene. Inadvertent kicking of auto parts debris can disrupt evidence supporting crash trajectories of parts, etc. Additionally, K-9 units (if used) are more effective in a search for a weapon (held by the suspect, for example) if they have an uncontaminated article of clothing, an uncontaminated used bandage (or other medical device that was used only on the patient of the scent target), or an uncontaminated car seat used for scent identification. If a group of people are standing in the inner perimeter, that could make that scent identification more difficult. Bicyclist riding the wrong way on eastbound Lake Cook Road into the debris field of the crime scene investigation in a fatal crash when the suspect in a domestic battery case died while fleeing Buffalo Grove police. An hour passed following the time of dispatch of the crash, but no crime scene barrier tape was established as an outer perimeter or an inner perimeter. There was no outer perimeter crime scene tape (yellow), and there was no inner perimeter crime scene tape (red). Inner perimeters are not always necessary, but the failure to establish the crime scene outer perimeter allowed a bicyclist to ride his bicycle into the debris trajectory field and into a zone approaching the would-be inner perimeter over one hour after the crash occurred. Police scenes frequently observed in Arlington Heights have shown Arlington Heights police officers having crime scene tape applied within minutes of their arrival. Buffalo Grove Battalion Chief Barna, whose village police department was involved in the high-speed “following” of the suspect that was killed in the head-on crash, tells the videographer that, “Arlington police are telling you to get behind that line,” where there was no line and no barrier tape, and there was no communication observed between Barna and any Arlington Heights police officer prior to his order. Throughout the afternoon, it did not appear that the crime scene was scrutinized thoroughly for a case involving a possible missing weapon. Although part of the scene’s view was obstructed, it did not appear that any K-9 was on scene to attempt to track the offender’s scent for a weapon. The suspect, who died while he was fleeing police, was initially reported to have fired shots, and was suspected of possibly having a weapon. As of Saturday afternoon, Buffalo Grove police said they had not found a weapon. Although unlikely, the suspect could have tossed a weapon out of his vehicle before he crashed. 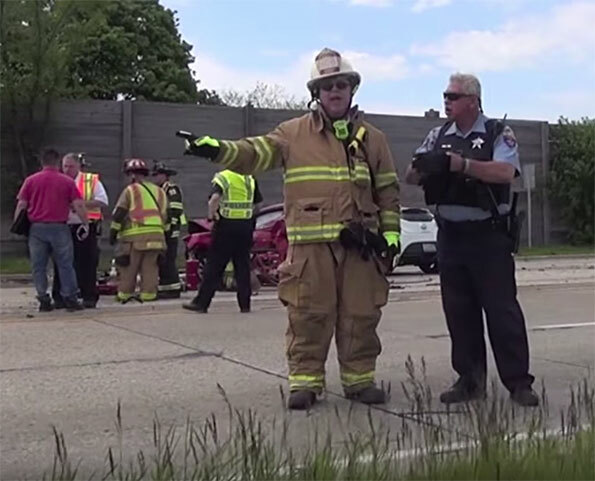 Since Buffalo Grove police stated that the officer “following” the suspect’s vehicle didn’t see the crash, it is also possible that the officer would have missed seeing the act of a weapon being tossed from the suspect’s vehicle before the crash. Also note that an unsecured weapon, lying on a car seat in this violent crash, could have been ejected out a car window and landed anywhere — even over the tall expressway sound barrier wall and onto contractor’s dump trucks and other trucks parked in the apartment complex lot just on the other side of the sound barrier wall. Police didn’t appear to comb the roadway shoulders or grassy parkways for a weapon, or the parking lot immediately south of the crash scene. However, one Cook County Sheriff’s police detective took a minor look at an area north of the Lake Cook Road and Nichols Road intersection at about 3:00 p.m.
Also, it did not appear that any Cook County Sheriff’s deputies inquired about any potential witnesses in the crowd of onlookers on the south side of Lake Cook Road during optimal opportunity time period. Fortunately the drivers in two other vehicles in the head-on crash were not killed, and their injuries were not initially believed to be serious. Fatal Crash During Police Pursuit on Lake Cook Rd West of Nichols Rd, Cook County, Unincorporated Arlington Heights.